Despite what seems like a simple line drawing map on their website that could lead you astray when arriving at the winery, Chêne Bleu, it is surprisingly easy. It may not seem so as first as you turn and weave your way around the scenic village of Crestet on a one lane one that always has someone who wants to go considerably faster behind you, but it is indeed quite direct. Of course my visit started a good deal before this. I met Pauline Dubier (who does their marketing in addition to being a trained enologist) at the biannual G-Night wherein Catalan winemakers show off their Grenache wines. Headed by eternal bon vivant, Joan Ignasi of Vinyes Domènech in DO Montsant, they often invite a few Grenache-forward wineries from outside of the region as well. As I made my way around the salon, I wound down the row of French makers and met the Rosé of Chêne Bleu which I went on to profile in my monthly column. 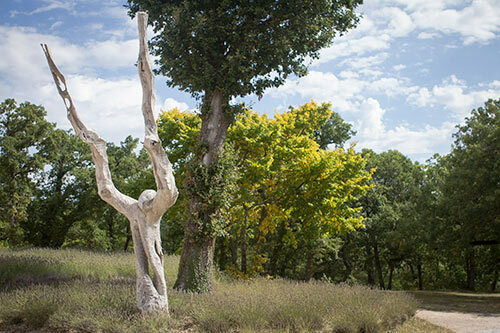 If you keep in mind that the beginning of Provence is a good five hours from Barcelona, it’s easy to see why for some time, I had been needing to pay a visit to Châteauneuf and Greater Provence but had yet to make it. After several attempts to dislodge myself from Catalan wine, I finally arrived at the beginning of a very warm September just before harvest and was met by Pauline at the cellar. We walked around what is a stunning property that was crafted with wonderfully restrained style; something so few are able to attain. The entire house has been heavily renovated by owners Xavier Rolet and Nicole Sierra who bought it in 1993. It had been for sale for some time given its rather remote location and heavy need of repair. Tossed in to this, AOC Ventoux is not as well known a region internationally as say Châteauneuf or Gigondas down on the other side of the mountain. Xavier was determined and as an avid wine lower with the means to renovate as he and Nicole saw fit, he could see a great deal of potential in the property. Wines had been grown there historically when it was an abbey and the elevation of 500m also makes for an ideal growing climate these days with a healthy hit of mistral, not to mention the views down to the slithering sheen of the Rhône in the distance. There is a wonderful fit and finish to everything you see when visiting. 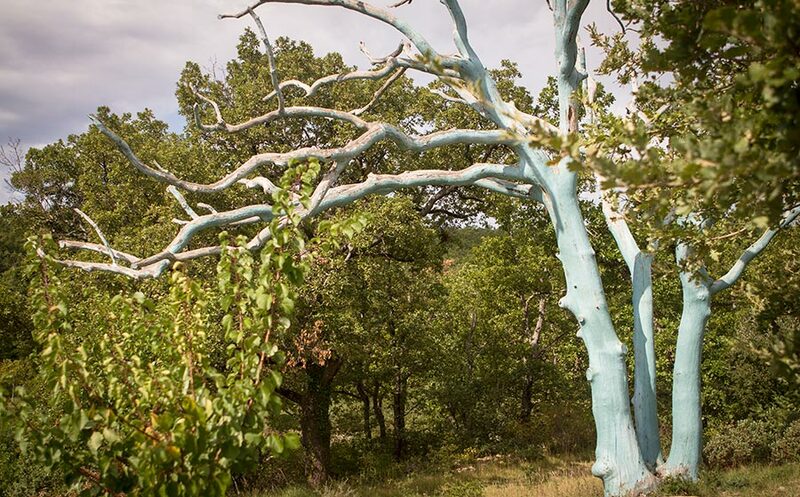 My personal favorites were the dead trees on the property that, instead of being chopped down were sculpted much like the namesake chêne bleu (blue oak) pictured above. The interior is simply gorgeous and intimately appointed for both casual tasting and events. There is no abrupt start and finish to parts new and old. It all flows together in to a harmonious cellar set in their 15th century home which produces about 50,000 bottles a year. And despite this, it all remains a family affair. Floral with pansies and peach blossoms, hint of minerality, but overshadowed by ripe lemon peel. Lovely acidity and full mouth feel. Slightly astringent in the finish with the lemon peel notes returning. Crushed strawberries and raspberries, orange peel to the nose. In the body good, fresh acidity with a punch of apricot tang than carries in to a relatively dry finish and shines as an example of perfect Provence style Rosé. Earthy in the nose with notes of licorice and ripe red plums, cumin. Red fruits in the body. Fresh and clean in to the finish, leaves the palate happy, blissful, and wanting more. Needs a good half hour to open up. Prune marmalade with licorice, thyme and currant to the nose. Wonderfully deep and complex aromas. Smooth in the mouth with a mineral texture along with clean acidity and red fruits that carry in to the finish. Earthy and aromatic in the nose, sweet cumin and a comfit of red fruits. Smooth on the palate with round tannins braced by solid acidity and dark fruit notes of prune and fig. Light, lingering finish with soft, harmonious cocoa notes. It should be noted that there is a marked change in the vintages of the top-end wines as they have been shifting their style to some degree. As such, when tasting the 2009 of Abelard and Héloïse again the 2007, the wines were a great deal fresher and lighter. It’s also important to note that there was no 2008 vintage of these two as they only bottle them in optimal years.